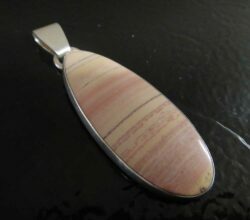 Handmade dolomite jewelry available from Glassando features lovely shades of pink and peach. It is great for anyone who loves unique natural gemstones or pink jewelry. 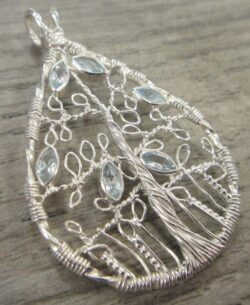 Our selection includes dolomite pendants and dolomite and sterling silver jewelry. Much of it is handmade by local Iowan artist, Dale Repp. 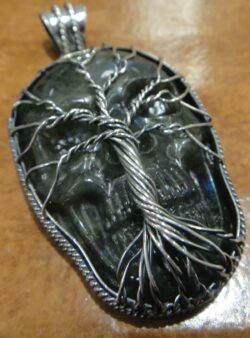 Artisan dolomite jewelry from Glassando includes dolomite pendants as well as dolomite and sterling silver jewelry. It is perfect for lovers of opaque gemstones, American-made jewelry, or large natural stone jewelry! 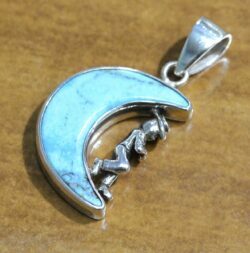 You can browse our website or stop into our locally owned retail store in downtown Iowa City in order to see our selection of dolomite jewelry and lots of other unique handcrafted jewelry too. Glassando is located inside Iowa City’s Old Capitol Town Center, which can also be called the University Capitol Center or the Old Capitol Mall. While Glassando does not have an outside entrance, it can be accessed on the ground floor of the building next to GNC. Parking is also available in the Capitol Street Parking Ramp, which does not charge for your first hour of parking! Stop by our jewelry store to see even more handcrafted pendants, necklaces, earrings, rings, and bracelets!